I do not eat a lot of pasta because it causes my sugar to rise rapidly but every once in a while I do crave Italian food. I decided to become ambitious one day and attempt to make ravioli for the second time in my whole cooking life. 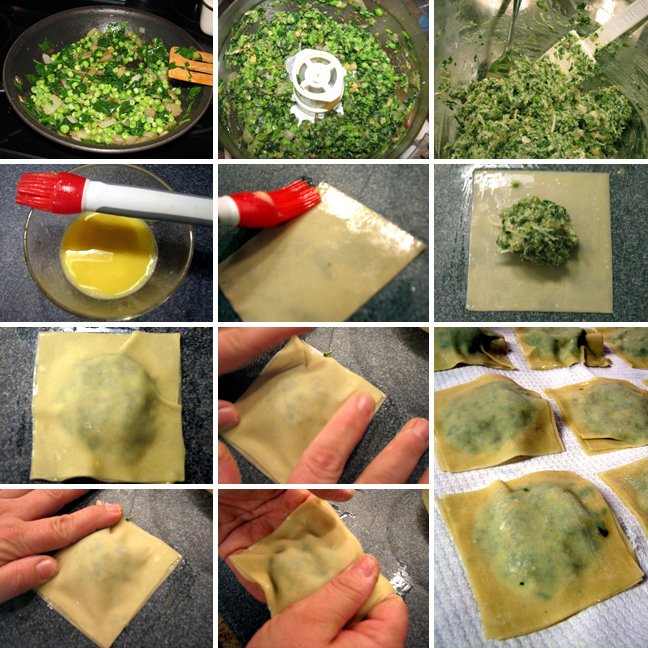 I love spinach in anything so I thought I would try to make spinach ravioli with peas and walnuts. I did not want to use a tomato sauce so I blended up some garbanzo beans for the sauce base and the results came out good. I loved it! I planned my food menu very carefully that day because I wanted this. The dish was such a nice change for me. Enjoy! In a 350 degree oven, toast ½ cup of walnuts. This takes about 10 minutes depending on your oven. The extra effort to toast the walnuts is worth it. Toasting the walnuts bring out a ton of flavor. Set aside and cool. In a sauté pan, heat olive oil over medium high heat. Add onions and garlic stirring constantly for about 5 minutes. Add the spinach and sauté until the spinach is wilted. 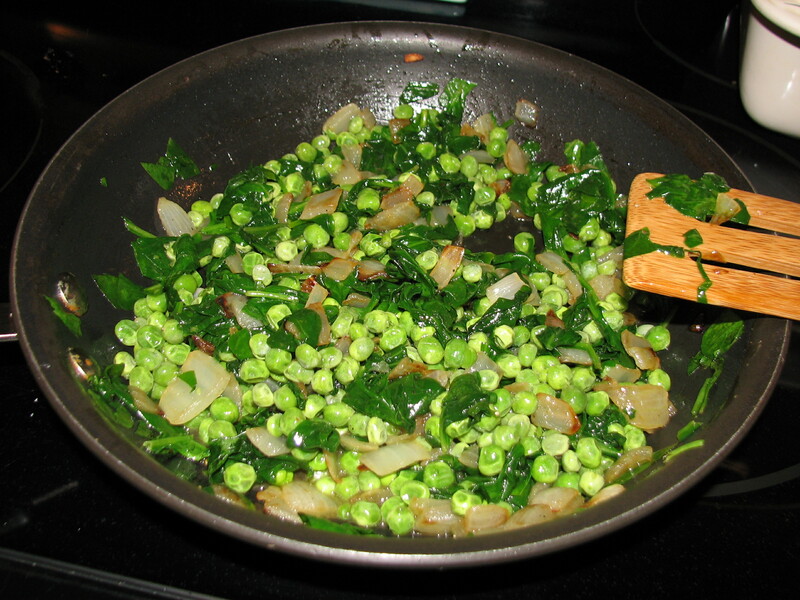 Add the thawed peas and sauté until peas are heated. Put the sautéed vegetable mixture in a food processor and cool. Add the toasted walnuts, and pulse a few times. You want the filling to be chunky. Add the ricotta cheese and Parmesan cheese and mix well. Set aside. Crack the egg and mix with the water in a small bowl to make an egg wash. Set aside. On a clean board, prepare the Ravioli. This is a lot of work, but so worth it. Lay one wonton wrapper on board. Add 1-1/2 to 2 teaspoons of filling. Brush the edges with the egg wash. Cover the filling with the 2nd wonton wrapper. Press seams together, and force any air bubbles out of the sealed wrapper so that the ravioli does not break or come apart during the cooking process. Repeat this process until you achieve the number of Raviolis you want. 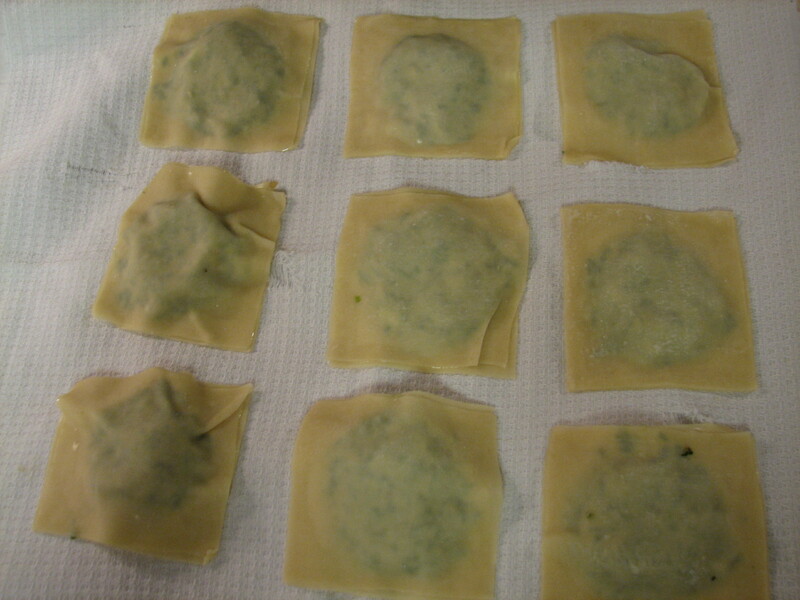 Put the raviolis on a cookie tray and cover with towel or a non-stick surface. Put the ravioli in the freezer for about 15 minutes. This helps prevent the raviolis from coming apart and makes it easier to cook. In a stock pot of boiling salted water, add the frozen raviolis one at a time. Cook for approximately 5 to 8 minutes just enough to cook the wonton wrappers and the raviolis float to the top of the stockpot. 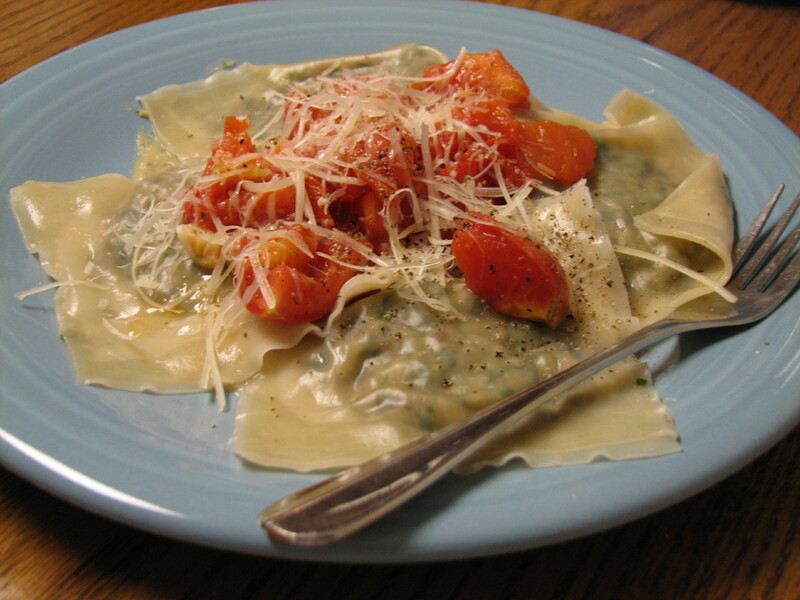 Transfer the raviolis to a plate and top with your favorite sauce. In this recipe I used a garbanzo bean sauce topped with sautéed tomatoes in olive oil, salt and pepper. This is a simple sauce that I use instead of a tomato based sauce. I make it to top over bread or pasta or steamed vegetables. Sometimes, I serve this with sautéed cherry tomatoes with olive oil, salt and pepper. The chunky style kind of reminds me of hummus but without the Tahini sauce and lemon. Sauté all the ingredients over medium high heat until beans are heated through. 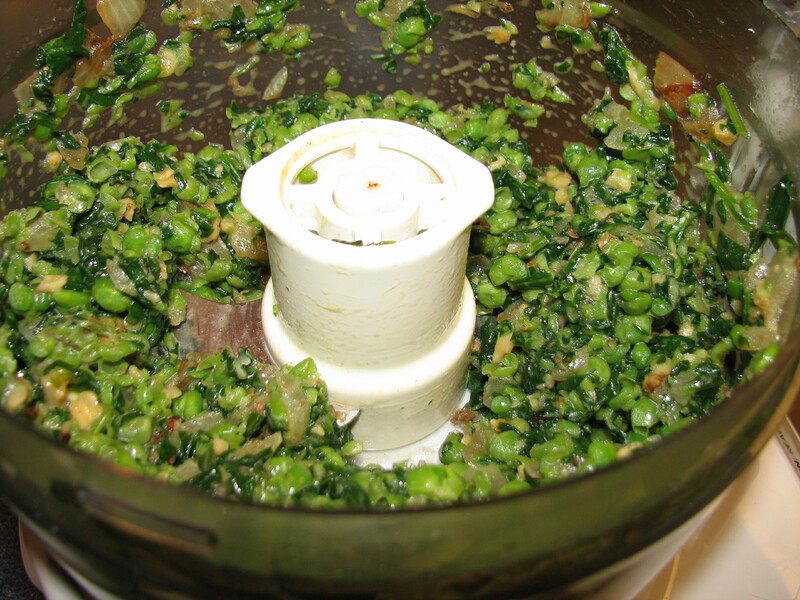 Put beans in a food processor or blender and pulsate until chunky or smooth. If putting on bread, I tend to keep the beans chunky. If I am putting this sauce over pasta it can be chunky or smooth, depends on the dish. If it is pasta I will probably keep the bean sauce chunky but if it is ravioli the sauce will probably be smoother. Since moving to Ohio from Michigan I have been busy with many things and seriously have not really cooked for friends like I used to. Last night, I had my first official dinner with friends. Getting to know people’s food tastes can become challenging and intimating sometimes. I was lucky because vegetarian food was the perfect food choice for my newly made friend. Tomatoes are in season right now and the fresh flavors really popped in this recipe I took from the current summer Vegetarian Times Special Farmer’s Market Cookbook magazine. I wish I thought of it – absolutely brilliant. I did not change anything in the recipe it was perfect. 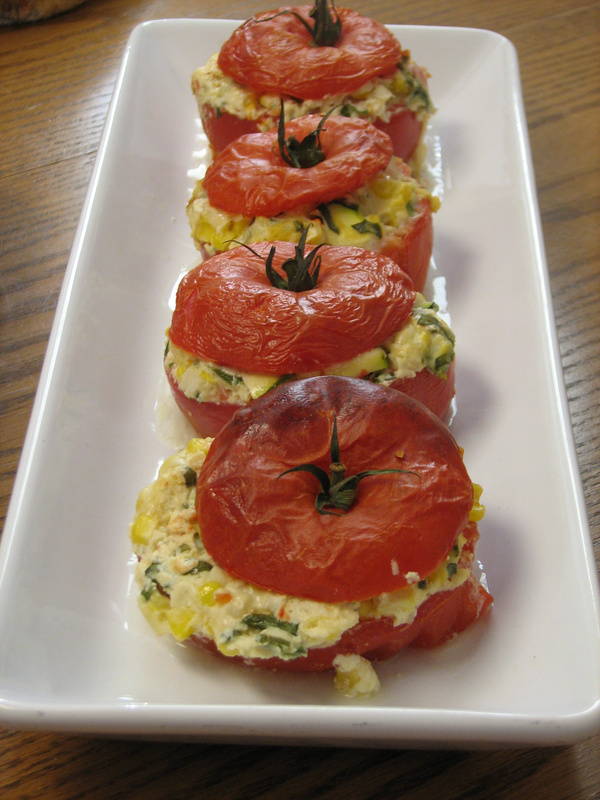 Preheat the oven to 350 degrees F. Slice the tops off the tomatoes and scoop pulp out of centers so that the filling can be stuffed inside the tomato. Discard half of the tomato pulp or reserve for another use. Finely chop the balance of the tomato pulp. Whisk together eggs and ricotta in a bowl until smooth. 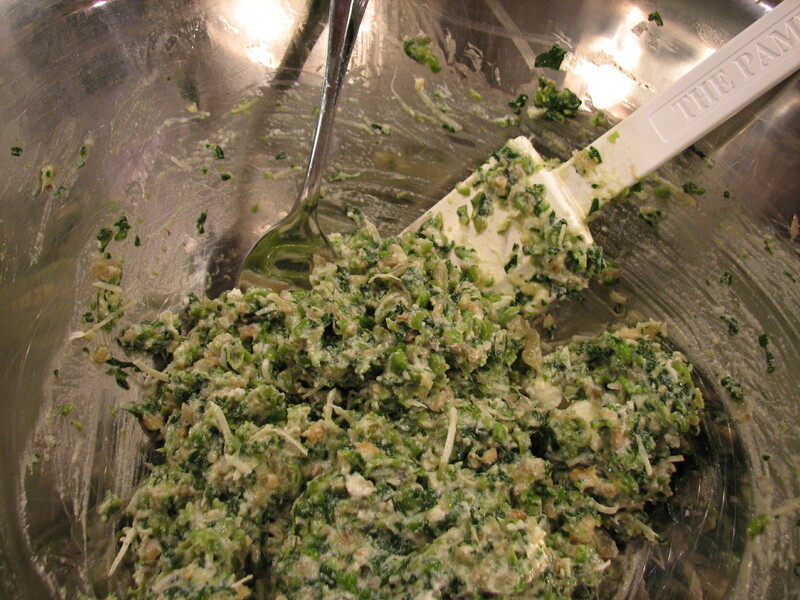 Add onion, basil, 2 tablespoons of the Parmesan, garlic, corn, diced zucchini and chopped tomato pulp; stir until combined. Fill each tomato just to the top with ½ cup of ricotta mixture, then sprinkle with ½ teaspoon of Parmesan cheese followed by 3 zucchini slices and cover with tomato top. Place in a baking dish. Bake 45 minutes or until filling is pulled up and tops are browned. Remove from oven and let stand 10 minutes before serving. I miss eating pasta and any Italian food sometimes. I do not really eat it because it is high in carbs, fat, and it causes my sugar levels to be high. It takes a while for the levels to come back down to normal. I decided to stop eating pasta and anything made with white ingredients a while ago and have been able to keep my sugars under control. I was in the mood for Italian food so I made the dumplings instead of using pasta. The dumplings came from watching the cooking channel show Ask Aida the other day. I substituted Arugula for spinach. I love this idea, and was pleasantly surprised. Next time, I will try using more natural and healthier approach to the dumplings. 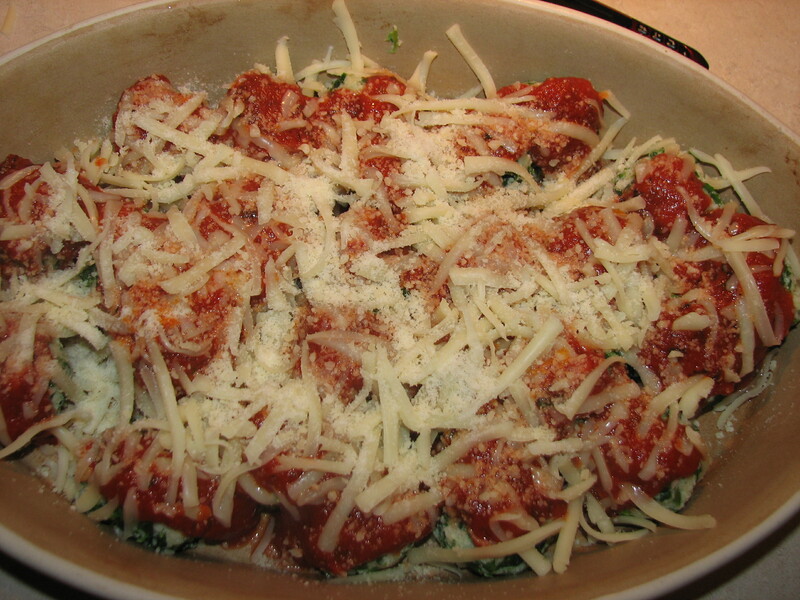 This recipe is a great substitution for pasta, still a little high in fat content but was very good. Enjoy! For Marinara Sauce: Heat 2 tablespoons of olive oil over medium high heat and add 2 gloves of fresh chopped garlic. Add one 16 oz can of your favorite tomato sauce, I happen to like Muir Glenn tomatoes so I use that brand. Add one to two teaspoons of basil fresh or dried, either one. Optional add a pinch of red pepper flakes. Season with salt and pepper and simmer for about 15 minutes. The sauce will thicken up. Add caramelized onions if you wish. Adjust your seasonings as needed. Set cooked marinara sauce aside. For Dumplings: Bring a medium stockpot of water to a boil then reduce heat to a simmer. Add salt. In a bowl add the eggs and milk together, beat well. Add the breadcrumbs to the milk/egg mixture and let the breadcrumbs soak up all the liquid. Add the rest of the ingredients and blend well. 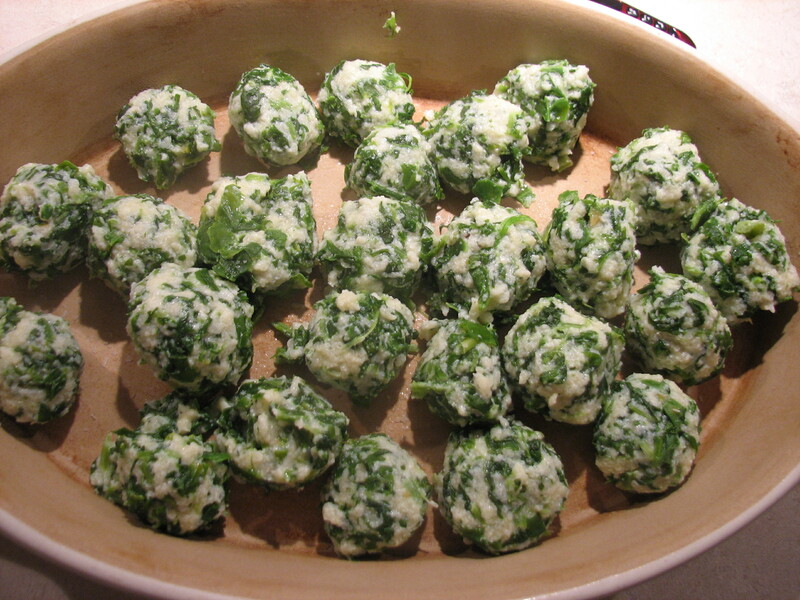 Shape the dumplings into small balls using a tablespoon to measure out the dumplings. Drop 10 dumplings at a time into the hot simmering water and let them cook for about 5 minutes until the dumplings rise to the top. Spoon the dumplings out with a skimmer and put in a colander to drain the excess water. Cook the rest of the dumplings you should have about 20 to 25 depends on how big the dumplings are. After all the dumplings are finished cooking, lay them single file in a stone or baking dish. 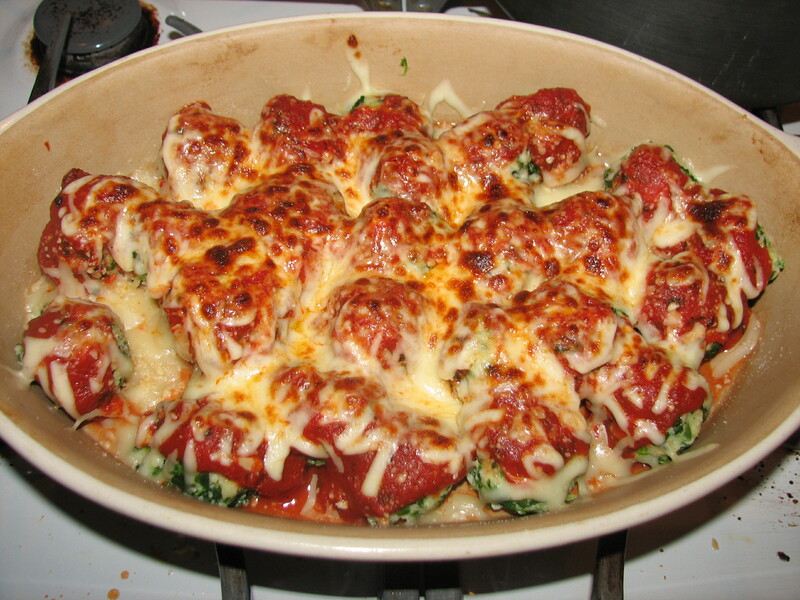 Spoon the marinara sauce over on top of the dumplings, and sprinkle with mozzarella cheese and a little bit of Parmesan cheese. Put in the oven set on broiler for about 5 to 7 minutes until all the cheese is melted and bubbly.